Ah, Boudreau Freret. The man whose name is constantly underlined with red squiggles because it’s kinda weird super unique and no spell checker in the world will ever recognize it. The man whose tweets have trained me not to drink anything while I’m reading them because it will end up coming out my nose. He’s awesome, y’all. And if anyone out there isn’t following him, please click here and remedy that immediately. When I saw that Boudreau had passed the “Creative Writer” award along to me, I got a little too excited. You know why? Because, while all these awards come with some sort of condition or rules for acceptance, this one is by far the most creative! Now, I’m going to tweak the numbers a bit, but here’s how this is going to go down. Below, you will find a list of seven (7) things about me. Four of them are true. Three of them are bold faced lies. Your job is to separate fact from fiction. Which ones are true? Which ones are falsehoods? Let’s see how you do! 2. My shoe once caught fire at a barbecue in London. This Englishman was gesturing really big while he talked to me, and he accidentally flung a piece of something that had caught fire on the grill – foil, paper towel, I don’t know what – onto my foot. I was wearing sandals and part of a strap caught fire. My foot got burned pretty badly. 3. I almost drowned in a riptide in Florida. My family was vacationing in Destin, and I decided to ignore the red flags. Smart, right? Yeah… never again. Thank goodness my dad is a good swimmer. 4. I used to have a pet squirrel. He fell out of a tree in our yard and we took him in. I fed him peanuts, which he ate while perched on my lap. He would curl up on the back of my neck, underneath all my hair, and go to sleep for hours. We named him Chester. 5. I made a guest appearance on the reality TV show “Two-A-Days.” It was this show on MTV a few years back, and it was filmed in Hoover, Alabama, which is a suburb of Birmingham. Basically, it was high school football meets “The Real World.” I like to call it the perfect storm. 6. I’m an award-winning water skier. I’ve been skiing practically since I was old enough to walk, and I got a scholarship to be on the University of Alabama’s waterski team. We were pretty good, and took home our fair share of awards. 7. When I was little, I made up my own language. In fact, I had my own “world” in my parents’ backyard. It involved a large circle of rocks (the “village”) and some nearby shrubs (the “jungle”). Sadly, the language I made up never caught on with anyone else, but I still thought it was awesome. Alright – what do you think? Which ones are true? I can’t wait to hear your guesses! Now: Tell me which ones you think might be true or not, and then go check out all these people’s blogs! *Also: Thanks so much to everyone who entered the 100 Followers Contest! I can’t wait to read your entries, and will post the winner as soon as I can! ⟵Contests, Giveaways, And Awards, Oh My! I have to guess that #7 is one of the truths – only cuz I did the same thing!!! Thank you so much, Anne. 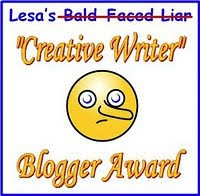 I'll put the award on my blog soon and pass it on. You have an interesting list. I'm going to guess that 2, 5, and 6 are the lies. I'm guessing that #2,5 & 6 are the fibs. Awesome! Well, I already DID this one… here–> http://eisleyjacobs.com/uncategorized/tagjessrosenbooks/ but I will let you guess which was my fib 😉 😉 I say 4 & 6 arent true… Am I right? Eisley: Gah! I'm so sorry! I should have checked. Oh well, good PR for you anyway! NUMBER SIX! WATER SKIING IS A LIE. Maybe I shouldn't play b/c I know you in real life. My guesses for the lies are #1, #3 and #6. I can't wait to find out which ones are! 1, 2, 5, and 7 are true. I think…. Jemi: YOU'VE NEVER HEARD OF TWO-A-DAYS?? Omg.. it was like, the best show ever. Natalie: You're so welcome, dear! I heart your blog! Boudreau, Erica, and Penelope: You're so welcome! Y'all rock. Seriously. I love your blogs and I love you. Um, who didn't make up their own languages as children? *looks around shiftily* So that's the truth. The others? Lies! Well, they can't ALL be lies. There are only 3 lies up there! Thanks for the award! I'm honored~I think. LOL! Love your creativity too by the way!